Greater left atrial area size as well as posterior and septal wall thickness were observed in women with preeclampsia with severe features. Preeclampsia with severe features (PEC), including end-organ dysfunction and severe hypertension, was associated with increased right ventricular systolic pressure (RVSP), decreased global RV longitudinal systolic strain (RVLSS), higher rates of peripartum pulmonary edema, increased left-sided chamber remodeling, and abnormal diastolic function rates, according to a study published in the Journal of the American College of Cardiology. Women with singleton pregnancies who attended Johns Hopkins Hospital, Johns Hopkins Bayview Medical Center, and Johns Hopkins outpatient clinics were enrolled in this prospective observational study (N=102). In the study cohort, a total of 64 women had PEC and 38 did not. 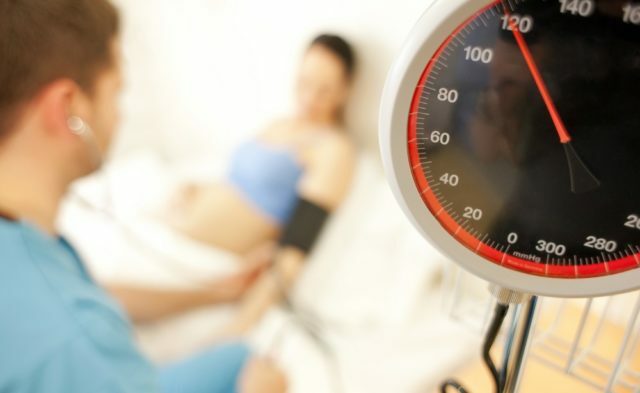 PEC was characterized by having a systolic blood pressure of ≥160 mm Hg or a diastolic blood pressure of ≥110 mm Hg on 2 occasions ≥4 hours apart, as well as a proteinuria level of >300 mg of protein in a 24-hour urine test or a urinalysis-tested protein/creatinine ratio of ≥0.3. Transthoracic echocardiography was used to identify cardiac abnormalities in patients with PEC vs women without PEC. The incidence of RVSP comprised the primary outcome measure, and the clinical secondary outcomes included the incidence of stroke, eclampsia, pulmonary edema, and mortality. According to transthoracic echocardiographic findings, women with PEC had significantly higher RSVP compared with controls (31.0±7.9 mm Hg vs 22.5±6.1 mm Hg, respectively; P <.001). In addition, pregnant women with PEC had significantly lower global RVLSS vs controls (−19.6±3.2% vs −23.8±2.9%, respectively; P <.0001). Mitral septal e’ velocity was also lower in the PEC cohort (9.6±2.4 cm/s vs 11.6±1.9 cm/s; P <.001), whereas the mitral septal E/e’ ratio was increased in patients with PEC vs controls (10.8±2.8 vs 7.4±1.6, respectively; P <.001). Greater left atrial area size (20.1±3.8 cm2 vs 17.3±2.9 cm2; P <.001) and posterior and septal wall thickness (median [interquartile range]: 1.0 cm [0.9-1.1 cm] vs 0.8 cm [0.7-0.9 cm], P <.001; and 1.0 cm [0.8 to 1.2 cm] vs 0.8 cm [0.7 to 0.9 cm], P <.001) were also observed in patients with PEC. The lack of data on whether patients had pre-existing cardiac dysfunction prior to PEC was a study limitation. Having several abnormal echocardiographic parameters on evaluation of PEC may “predict long-term cardiovascular events, because it is well-known that a significant subset of women who have had preeclampsia are more prone to develop[ing] coronary artery disease, cardiomyopathy, and other cardiovascular diseases,” the investigators noted. Vaught AJ, Kovell LC, Szymanski LM, et al. Acute cardiac effects of severe pre-eclampsia. J Am Coll Cardiol. 2018;72(1):1-11.